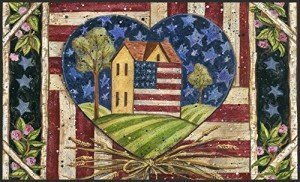 A patriotic decorative USA-Produced indoor-outdoor designer mat makes a great gift during the patriotic holidays. A design of a heart and a loving home in patriotic colors of red, blue and white complete with stars and stripes make this patriotic mat a great way to show off your national pride to your visitors. This 18″ tall x 30″ wide standard size made in USA mat has a low-profile to prevent tripping or blocking of doors. This welcome mat in bold and vibrant colors has a rugged non-skid Durgan backing and is topped with a polyester felt topping. This ensures long lasting quality and durability. Permanent dye and heat sublimation ensures the colors to be fade, mildew and UV resistant. This patriotic welcome mat has a 42% rubber, 38% latex, and 20% polyester construction. This beautifully designed patriotic decorative USA-Produced indoor-outdoor designer mat would certainly make a wonderful gift for Memorial day, Independence day or labor day celebrations.